It’s been 6 months since I finished the first 66 days of my green smoothie habit. These breakfast drinks are fully integrated in our morning routine. The section where Openshaw listed all the different types of greens she uses in her smoothies and what parts of the plant to use was excellent. This week I left the ribs of most of my leafy greens in and I’m excited to try my radicchio and dandelion greens smoothies. I wish there had been a similar breakdown for the fruits and to that end there was not nearly enough of the content that I wanted. Anecdotes and unsubstantiated claims abound. I also thought her recipes had too much going on. I would not recommend this book, but I’m glad I read it. Tonic is a local kitchen and juice bar located in Rochester, MN. Clayton and I stopped in at the start of a road trip and they had a great selection of fresh juices and smoothies. I went with the Coastal Sunshine: orange, lemon, lime, and carrot. It was good, if a little heavy on the carrots. For dinner I ordered the Market Vegetable Wrap and Clayton ordered the Midwest Mac. I ate more of Clayton’s meal than my own even though I was pleasantly surprised by the kale chips. Our smoothie consumption stayed steady after I stopped tracking this habit daily. Of all the habits I have featured on this blog, this one has been the most successful. I feel comfortable moving forward without an additional check in! Please stay tuned for a new habit as I continue my journey of personal development. DONE – 66 consecutive days of drinking a fruit and vegetable smoothie. DONE – Smoothies have been consistently prepared a week in advance. DONE – 66 photos with smoothie recipes shared on Instagram. DONE – 2 books read on food science. DONE – 3 new restaurants with vegetarian options visited. DONE – 11 weekly posts shared. My weight has not changed since adding smoothies to my diet. Aborted – 2 cooking classes taken that will help us get more vegetables in our meals. Found 2 new vegan YouTube chefs to follow. Incentive: Since a B is still passing, Clayton and I will be going on an excursion while in Mexico! The most important thing I learned through this exercise is that I hate vegetables, but I have come to enjoy my green smoothies. I cannot say if there has been an objective improvement to my health, but subjectively I can rationalize that getting more fruits and vegetables on a daily basis is better than not getting them. I will keep up with this habit and look forward to sampling new fruits and vegetables in my recipes. Please enjoy the holiday season, and look for new habits from me next year! The last item on my action plan was to attend 2 cooking classes that would help get more vegetables in our diet. All the classes I could find this time of year centered around holiday feasts so I decided to find some vegetarian YouTube chefs that could help me accomplish the same goal. A happy coincidence is that my favorite chefs have smoothie videos for me to feature! Kristina is funny, engaging, and I like her style. She has a full backlog of videos for me to peruse that cover diet, exercise, and other interesting topics. The videos have great production value and they are very well organized. She has 26 videos just on juice/smoothies! Sometimes alternate solutions turn out better than the original might have. I am excited to have new YouTube channels to follow that will provide a lot of great meal ideas as I maintain this habit in the future. What is your favorite way to work more vegetables into your diet? Please share your ideas in the comments! Part of my action plan in building this smoothie habit was to try vegetarian meals at 3 new restaurants. It was a happy coincidence that two of them had smoothie options! This restaurant is located in a converted home and now houses the restaurant and other wellness shops. We were the only patrons in the restaurant for a while, so I had plenty of time to take in the surroundings. The mosaics and artwork all over the walls provide a lovely atmosphere. They only serve organic, vegan, raw food which is a big departure from our normal diet. I ordered the Sunrise Smoothie, rawnola, and a banana crepe for breakfast. The smoothie was top notch and made with banana, pineapple, dates, and orange juice. The rawnola was odd… I got used to the taste after a few bites, but I would not recommend it. The banana crepe was not at all what I was expecting, and I didn’t eat much of it. The crepe itself was made with bananas and was filled with avocado, carrots, and onions. I didn’t love the food, but if this location was closer I would be at their smoothie bar all the time! Clayton selected this restaurant, and it was my least favorite of the three we visited. It is located in a quaint neighborhood, but there is only street parking. My favorite part about the location is that it is across the street from the Dead Media Record Store. I ordered the Green Curry Rice (a staff favorite) and Clayton had their chicken noodle soup. The curry was spicy, and different than what I was expecting. I really enjoyed the citrus they added, but once that was gone I lost interest in the rest of the dish. Clayton’s soup was okay, but didn’t seem to have much chicken or noodles. The bread was fantastic! The outside of the cafe is uninspiring, but inside is vibrant. There are murals, plants, and chalkboards covering almost every wall and window. It’s a great atmosphere. We arrived at an odd time and the kitchen was closed to switch from the breakfast/ lunch to dinner fare. We were still able to order a smoothie, cookie, and cherry scone. The smoothie had mixed berries, bananas, and grape juice and was delicious. The cookie was average, but the scone was exceptional. I am excited to visit again and try the vegan mac and cheese, after 5 pm. Setting out to visit 3 new restaurants that specialized in vegetarian food certainly pushed me out of my comfort zone. While none of them have become a new favorite, I am glad we made the effort to try something new. What is your favorite vegetarian restaurant? Please share your favorite menu item in the comments! Part 2 offers a tremendous amount of recipes, some more appetizing than others. After reading through the recipes I’m excited to try new ingredients like bok choy, celery, and tomatoes. This book is a quick and enjoyable read, but there were too many dubious claims for me to give it a higher grade. In appendix 2 Clent Manich lists out 18 benefits he has experienced from drinking green smoothies including whiter teeth and sweeter breath. There is also an “Anticancer Smoothie” recipe. Despite the widely quoted material there still seemed a lack of credible evidence. I read this book hoping to get some new ideas for smoothies recipes and pick up some helpful tips on smoothie prep. In that respect this book was spot on, but could have been 50 pages shorter. Did you notice any significant changes once you started drinking green smoothies? Please share your experience in the comments. Tuesday – green smoothie from Jamba Juice. Wednesday – lunch and green smoothie at Vegeria. Thursday – buy ingredients to make a smoothie at family’s house. Wednesday – Naked Juice green smoothie. Thursday – forced down a Boathouse green smoothie after our second Thanksgiving dinner. Vacations with family always seem to get away from me. There are so many people to see, and I always underestimate the time it will take to do anything. Also people don’t just go along with my plans like I anticipate they will. At 5 pm on Wednesday, when I realized that we would not be able to accomplish my smoothie plans, I took advantage of a Walgreen’s pit stop to stock up on backup smoothie options. Naked juice and Boathouse were not ideal solutions, but it was unrealistic of me to expect to be able to take over my aunt’s kitchen on Thanksgiving to make a green smoothie. A good lesson that I have learned in building these habits is to be flexible. I need to make this habit work in my normal life, and that means adjusting to hectic schedules while still making this habit a priority. I’m glad to be back on track, and drinking our home-made smoothies. Do you have any holiday smoothie recipes? Please share them in the comments! I’m half way through the initial 66 days of building this smoothie habit. Let’s take a look at the numbers! 36 of 66 consecutive days of drinking a fruit and vegetable smoothie. Smoothies have been consistently prepared on the weekend. 36 of 66 photos with smoothie recipes shared on Instagram. 1 of 2 books read on food science. 0 of 2 cooking classes taken that will help us get more vegetables in our meals. 1 of 3 new restaurants with vegetarian options visited. 6 of 11 weekly posts shared. 2 cups chard, 1 cup spinach, 1/2 cup raspberries, 1/2 pear, and 1 cup water. Overall I feel like I am making good progress on this habit. I was disappointed to see that there has been no change in my weight, but eating more fruits and vegetables is better than not. Not everything is dependent on a scale, and that was not the primary objective in developing this habit. I need to get on the ball with the cooking classes, but everything this time of year is related to Thanksgiving. Ah, I’m sure something will turn up! Mixing up the ingredients by usings fruits and vegetables that I wouldn’t normally eat has kept up my enthusiasm. This project would be tedious if we ate the same thing over and over. My favorite new fruit in smoothies is honeydew and vegetable is chard. I’m happy that we have made it to the half way point, but this is where things will get more difficult. With Thanksgiving this week I am worried that we might fall off the wagon with all the travel. Please share any helpful tips and tricks you have about eating well while traveling in the comments! My smoothie inspiration board is starting to take shape. Here are the top resources I have pinned so far. There are some really fancy smoothie photographs on Instagram. It has definitely inspired me to try and step up my photo-journal game. Some of the recipes I have tried have been successful, but mostly all of these enticing smoothie pictures keep me on track with my own daily habit. This website has a number of excellent smoothie recipes. They also run a 30-day challenge that sends you weekly emails with recipes, shopping lists, and interesting articles and reference material. The next challenge will start 01/01! I have pinned a number of quick guides, and they have certainly helped me when shopping for ingredients. I don’t always want to follow a specific recipe so it is good to have a general formula to follow. I have stuck pretty close to the 2 cups leafy greens, 1-2 cups of fruit, and 1 cup water. These stainless steel straws were a recommendation from my friend, Amy. My shipment is already on the way and I cannot wait to try them out. Another benefit of sharing my experiences online is the feedback, encouragement, and suggestions I get from friends and follower to help me build this habit. Green smoothies are a very hot trend right now, and I am glad to have a place to house all of these great resources. Please share some of your favorite sites in the comments! Green smoothies are all the rage right now, but a few people, including my mom, said to be careful because drinking my veggies might not be as healthy as eating them. So I thought it would be a good idea to look into the pros and cons of green smoothies. I started my research at the USDA and Mayo Clinic and found they both have recipes for green smoothies. That seems like a good endorsement to me. The articles I found on the the Washington Post, Time, and USA Today seem to have balanced reports on the topic. They linked to similar studies and interviewed nutritional experts. While green smoothies are not as nutritious as eating whole fruits and vegetables they are a good way to get people to add fruits and vegetables to their diets. Also green smoothies shouldn’t be a meal replacement unless you try to balance the carbs with proteins and good fats. Nothing I read has made me want to give up this green smoothie habit. I will increase my vegetable to fruit ratio going forward, and use 3 cups of vegetables to 1 cup of fruit. I will also keep using ingredients that we wouldn’t normally eat whole, like carrots and beets. Have you read any persuasive/ fact based articles on smoothie science? Please share the link in the comments. Cheers! When we decided to add smoothie making to our regular routine, Clayton insisted that we needed a new blender first. We have been limping along with our $30 Hamilton Beach Blender for years, but it took about 20 minutes to get anything smooth enough to drink. Our selection criteria was based on blending power, a container larger enough for 2 smoothies, and personal recommendations. 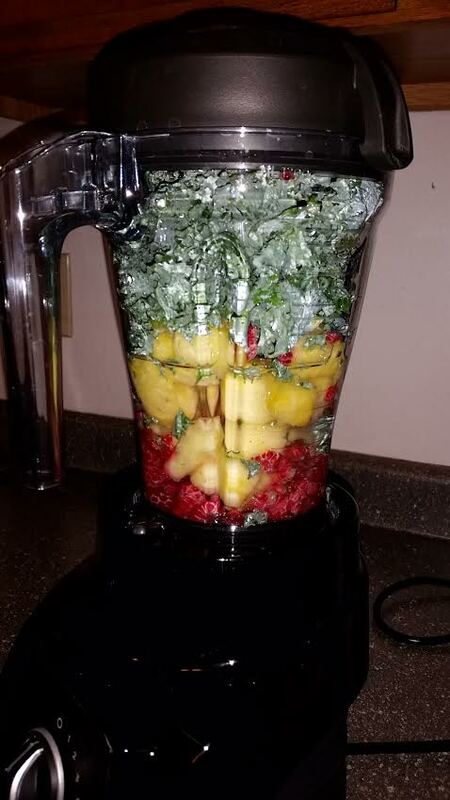 Kale, pineapple, and raspberry pre-smoothie in our Vitamix S30 blender. After looking into these blenders specifically, I also read through this consumer report. Vitamix blenders popped up on the list multiple times. I also saw that some of the Nutribullet blenders were on their “Do Not Buy” list for some safety concerns with the blades. We ultimately decided on the Vitamix S30 Blender. It was the cheaper of the Vitamix options and the container was just large enough for our purposes. It also fits neatly under our cabinets. We have been using it for over a week and I have been very pleased with the performance. It also came with a fun cook book, so I am excited to try some of the recipes. The best part is that it is dishwasher safe! Are there any other tools that are imperative for smoothie making? Please share your tips in the comments.